Taking stock of progress and future challenges, the Permanent Forum on Indigenous Issues closed its sixteenth session today with a batch of strong recommendations for improving the lives of indigenous peoples, and the message, “nothing about us without us”. The Forum sent the Economic and Social Council three draft decisions (contained in document E/C.19/2017/L.2) on its future work, the first of which would authorize a three-day international expert group meeting on the theme “Sustainable development in territories of indigenous peoples”. The second and third draft decisions concerned the venue and dates for the seventeenth session of the Forum and the provisional agenda for that meeting. Encouraging countries to take concrete actions, such as El Salvador’s development of a national action plan on indigenous peoples, she added that there was a common thread among the hundreds of interventions that indigenous representatives from around the world had made in the last two weeks. “Far too many of the interventions described encroachment on traditional lands and territories, of natural resource extraction, deforestation and infrastructure projects that had displaced and dispossessed indigenous peoples.” It was particularly ironic because indigenous peoples had a vast amount of traditional knowledge about their environment that could help in achieving climate change adaptation and mitigation. “Why wouldn’t the United Nations want to work with us?” she asked. Expressing concern about the situation of indigenous human rights defenders and the high rates of incarceration of indigenous peoples in some countries, she said, “there is something wrong with a criminal justice system that imprisons indigenous peoples to such a degree”. In its closed meetings, the Forum had heard numerous stories of human rights violations, as well as examples of initiatives States had undertaken to live up to their commitments. While acknowledging that many States were taking efforts to improve their relationship with indigenous peoples, she also noted that more work was necessary to ensure that indigenous peoples genuinely enjoyed their right to self-determination. Including the report containing the draft decision, the Forum approved a total of seven reports today as presented and orally revised by Rapporteur Brian Keane. While the second report (document E/C.19/2017/L.3) detailed the procedural aspects of the sixteenth session, including dates, venue, proceedings and attendance, the third report (E/C.19/2017/L.4) expressed concern about a gap between the formal recognition of indigenous peoples and the implementation of their rights in practice and outlined various recommendations to the Council. Urging all States to substantially increase the human, financial and technical resources made available to implement the Declaration, the Forum encouraged the International Labour Organization (ILO) to promote the ratification of the Indigenous and Tribal Peoples Convention, 1989. The report concerning follow-up on the recommendations of the Permanent Forum (E/C.19/2017/L.5) highlighted the empowerment of indigenous women and youth. Urging States to cooperate with indigenous peoples to prevent and eliminate all forms of violence and discrimination against indigenous women, children, youth, older persons and persons with disabilities and to support measures aimed at ensuring their full and effective participation in decision-making processes at all levels, the Forum also called upon the Council, including its youth forum, the high-level political forum on sustainable development, the Commission on the Status of Women and the Commission for Social Development, as well as other relevant United Nations forums, to include representatives of indigenous youth-led organizations in their meetings. According to the report on implementation of the Permanent Forum’s six mandated areas (document E/C.19/2017/L.6), the Forum welcomed the Organization of American States’ adoption in 2016 of the American Declaration on the Rights of Indigenous Peoples. Drawing attention to situations around the world, the Forum encouraged the Government of Bangladesh to allocate sufficient human and financial resources with regard to implementing the Chittagong Hill Tracts Accord and called on the Government of the United States to comply with Declaration provisions and to ensure the Great Sioux Nation’s rights to participate in decision-making, considering the pipeline would affect them. It requested the Governments of Finland and Norway to renegotiate the Deatnu river fishing agreement with consent of the Sami people and urged the Government of Colombia to promote and guarantee the rights of indigenous peoples in the development of a regulatory framework of the Colombian peace agreement, with their full participation. In recommendations on culture, education, health and economic and social development, the Forum called for a range of actions. 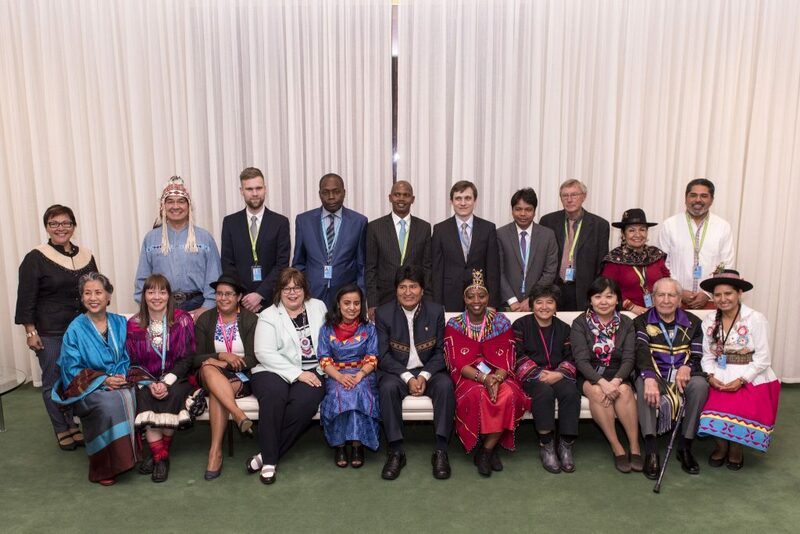 It encouraged all stakeholders’ contributions to the Indigenous Navigator framework and other tools to strengthen monitoring of the Declaration on the Rights of Indigenous Peoples, the World Conference and the 2030 Agenda for Sustainable Development. Concerned at the World Bank’s recent grant of an indigenous peoples’ policy waiver, the Forum requested the financial institution to ensure that waivers would not be used in the future and recommended its engagement with the Special Rapporteur on the rights of indigenous peoples, the Expert Mechanism and the Forum in developing guidance for the implementation of the new Environmental and Social Standard 7: Indigenous Peoples. On the environment, recommendations that had been made at previous sessions on conservation and human rights must be implemented urgently, the report stated. The Permanent Forum urged the Government of Kenya to recognize and protect the rights of the Ogiek and Sengwer peoples. 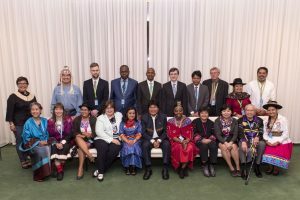 It also urged the International Union for Conservation of Nature to establish a human rights-related task force to work with indigenous peoples and recommended that States developed laws and policies with regard to traditional knowledge. In its report on its future work (document E/C.19/2017/L.7), the Forum recommended that a comprehensive plan for the International Year of Indigenous Languages was developed with the United Nations Educational, Scientific and Cultural Organization (UNESCO), in cooperation with the Expert Mechanism, the Forum and the Special Rapporteur and indigenous peoples, and presented at its seventeenth session. On the United Nations Framework Convention on Climate Change (UNFCCC) and the Paris Agreement on climate change, the Forum welcomed both instruments’ decisions to establish a platform on local communities and indigenous peoples. On the Convention on Climate Change, the Forum urged Member States to operationalize the platform in accordance with the Declaration’s provisions. The Forum’s report on dialogue with Member States, United Nations funds, programmes and specialized agencies (document E/C.19/2017/L.8) highlighted discussions on issues of concern. The Forum urged the United Nations funds, programmes and specialized agencies to have special focus on the Declaration’s implementation and to adopt policies to inform their work with indigenous peoples. The forum also requested the Inter-Agency Support Group on Indigenous Peoples’ Issues to step up cooperation in order to operationalize indicators on land tenure and changes in land use pertaining to traditional territories of indigenous peoples. Welcoming the first ever indigenous media zone, which had been established at its current session, the Forum encouraged its continuation at future sessions and encouraged United Nations entities to continue collaborating with indigenous media at regional and national levels. The Forum also approved a series of informal papers containing recommendations on agenda item 9, concerning the 2030 Agenda, item 10 concerning dialogue with the Special Rapporteur on the Rights of Indigenous People with regard to indigenous human rights defenders, studies prepared by members of the Permanent Forum and item 11 concerning follow-up to the outcome document of the World Conference on Indigenous Peoples. The Forum concluded with a spiritual message from Chief Wilton Littlechild, which began with expressions of gratitude to everyone, “from the last to the first”, from security officers to the new members of the Permanent Forum. “Bring home health and happiness,” he said, expressing wishes for a new decade of peace and reconciliation.